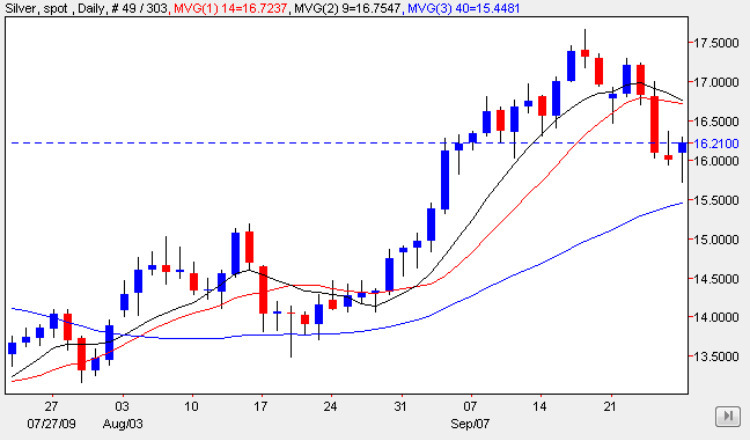 An encouraging day for silver bulls yesterday, as the silver spot chart closed the trading session with a deep hammer candle, suggesting that we should see silver prices rise sharply tomorrow as a result. This is generally a strong buying signal, particularly as it has followed on from the bullish gravestone doji candle of Friday, which combine to provide a powerful buy. With the support level just below the $16 per ounce level providing a good platform, and with the bullish tone reinforced in the spot gold price chart, the short term outlook is now very positive for both gold and silver bulls in the short term, however for the longer term trend to be re-established we need to see a break and hold above the $17.50 per ounce level in due course, which will signal that the upwards trend is back in place once again. For silver however the key point remains the resistance in the $17.50 to $18.50 price region which may prove to be a significant barrier to any move higher in due course.